The children had a fantastic night. All were asleep by 10:15. The children began to wake at 6am but were very good at keeping quiet and not disturbing others. All the teachers were very impressed! We had an excellent breakfast to set us up for the day, sausage cobs or croissants were the most popular. After this it was time for our first activity. 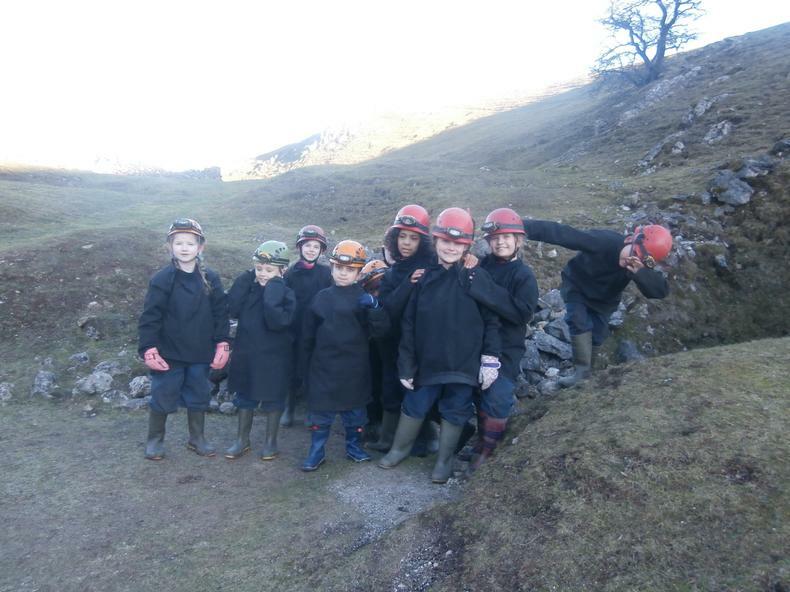 Foxes and Badgers set off caving. Foxes went to Mouldridge Mine. This involved a short walk from the mini bus before entering the cave through a hatch. We saw lots of stalactites and loads of icicles too. As we went deeper into the cave, the tunnels got smaller. We ended up ducking an even crawling at times to get through the gaps. A favourite part was dropping down through a small narrow hole, almost all the children attempted this and even had a second go. The last surprise was a tiny tunnel leading to an opening where we could see loads of crystals. We made our way out of the caves then back to the bus so we could have lunch ready for the afternoon. Badgers set off for Devonshire Mine. A short journey to Matlock in the mini bus, then a long, steep climb up to the entrance to the cave. We were all a bit nervous about climbing down the ladder but once we were on solid ground again, we were ready to explore. Tom did a great job guiding us around the cave and making sure that we avoided the deep holes and crevasses on the ground. 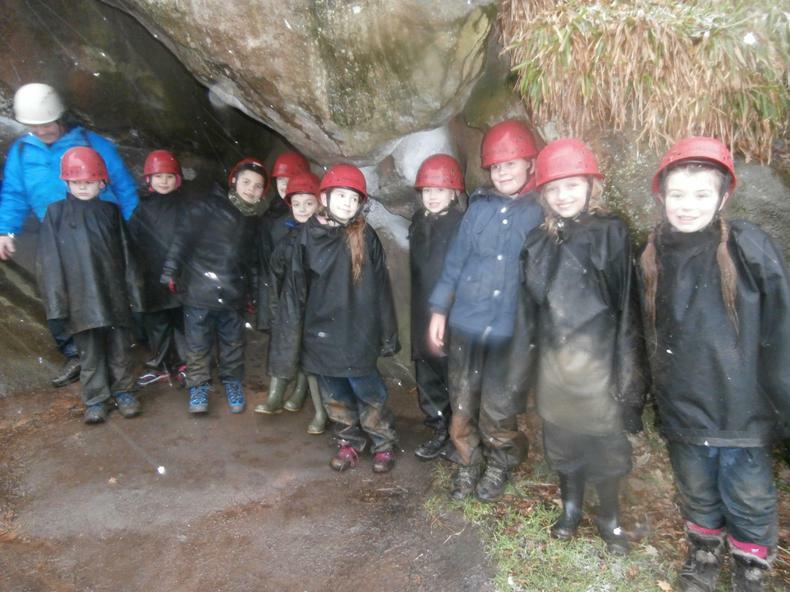 We spotted icicles, stalactites, flotsam, a sleeping bat and old mine shafts. The children worked together to make sure that everyone fitted through the narrow corridors. Our final challenge in the mine was to turn off our head torches and walk a short, circular trail. The children were so brave and everyone had two goes as it was so much fun! Owls had Aiden as their instructor today and started with abseiling. Although it was very foggy around Duke’s Barn, this had cleared at Miller’s bridge and a great view was had by all as they abseiled down. Everyone went down both on their own, and with a partner, and the great teamwork meant they each had three goes. All agreed that it was more fun with a friend! Not many can say they have abseiled in the snow so well done to all the owls for being so brave! After a good lunch, Badgers and Foxes set off for an adventure walk. We strolled up the lane, hiked up another steep hill through the forest, squelched through mud and crossed streams using stepping stones. We got very warm and some of us had to remove a layer or two. Eventually we made it to the top. After finding a sheltered spot, we had a pit stop – just enough time to have some much needed hot chocolate. We walked over the top of the hill. It was very cold and we had to put our layers back on, hats on and hoods up to keep our ears warm. A quick snowball fight and then we headed back down the hill, through the farm- that was smelly and squelchy then back to Dukes Barn. Owls followed in the intrepid footsteps of the Badgers as they set off to Devonshire mine. Although going into the mine made some feel a bit wobbly they did us proud by overcoming their fears and fully taking part in the activity. 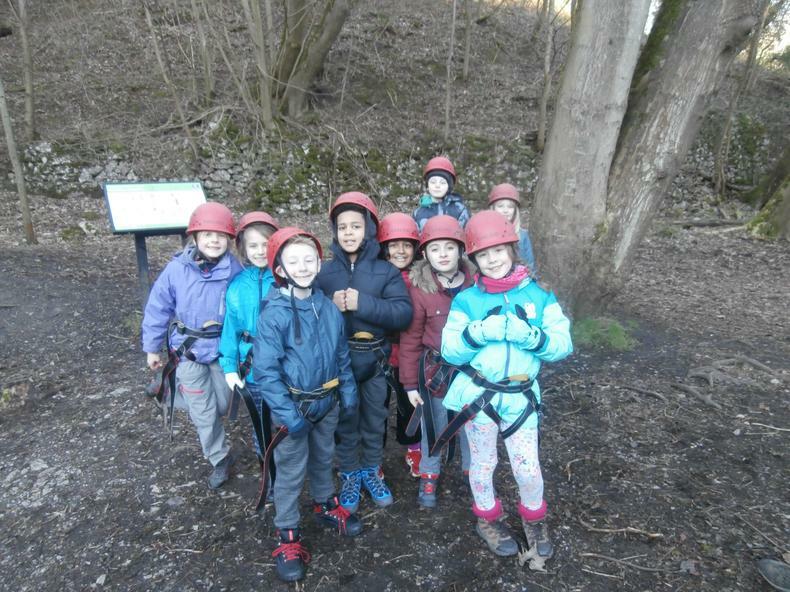 They again worked well as a team, encouraging and motivating each other, ensuring no one got lost or left behind and Mrs Tinkler was very pleased with the encouragement from the Owls when she got stuck in a very tight gap! They learnt how the sedimentary rock that made up a lot of the mine used to be on the sea bed at the equator, many moons ago, but has now ended up in Derbyshire. As the Owls experienced total darkness they tried to wave to themselves but it was too dark to see it! Dinner was delicious, pasta and meatballs followed by sticky toffee pudding for dessert. We had some free time, spent lots of money in the souvenir shop and then settled down in pjs, onesies etc. with our teddies to watch a movie. We are all very tired and the teachers expect everyone to be asleep quickly. We arrived safely after a very quiet bus journey. We were were almost in Beeley before the singing started. Good old Dr. Knickerbocker. We had a short introduction from Andy and a tour of the building before being given our pillow case, sheet and duvet cover. The first challenge was identifying which was which. The children made a good effort to make their own beds. Although it is difficult to tell which dorm had least help from staff but we think winning dorm was the Red Dorm. After devouring lunch like ravenous children, we got ready to go on our first activity. We layered ourselves with base layers, t-shirts, jumpers, hoodies, waterproof trousers, coats, hats, scarves, gloves - anything warm and headed out. Badgers and Foxes went abseiling from Millers Dale Bridge. The teachers are really proud of how brave the brave the children were. Almost all the children had a go. After abseiling once, they couldn't wait for a second opportunity. They had a go at tandem abseils. The verdict is tandem is best. Owls set off with a special guests - Mr Rossington and Poppy the dog. They scrambled, slipped and slid all over the place. The highlight of the walk was the Grand Finale - a pop-up cafe and a snowball fight. Dinner was a success - giant fish fingers, chips and peas, followed by ice cream. After some free time, came the evening entertainment. After using a lot of matches, Miss Carter managed to light the camp fire. We all got kitted up in waterproofs and wellies, before enjoying some smores, looking at the starlit sky (we could see lots more in the countryside), singing a few songs and listening to a bed time story. We've had another wonderful day, and now have chance to update you all! The Foxes set off in high spirits this morning, singing in the minibus on the way to Millers Dale Bridge to abseil. Everyone got their harnesses on, and everyone had a go at hanging from the top of the bridge in their harness. Almost everyone abseiled down to the bottom! The Foxes showed great team work, and encouraged each other, cheered each other on and also helped carry all the equipment to and from the minibus. After our sandwiches, crisps and cake (some fruit was consumed!) the Foxes set off in the minibus to Chatsworth. We parked the minibus (free of charge!) in Chatsworth car park and set off to walk back to Dukes Barn! We had a lovely walk up through the trees and had great views down over the gardens. The weather was bit wet but the trees gave us some good shelter. We climbed up and up until we found snow on the ground! We played a game of 123 home and also found a magic stream....! We met the Owls on their way to the minibus and then continued down the hill to Dukes Barn. The Badgers went caving this morning, with new instructors Daz and Becks! After parking just above Matlock Bath, they had a long steep walk up the hill to The Devonshire Mine. 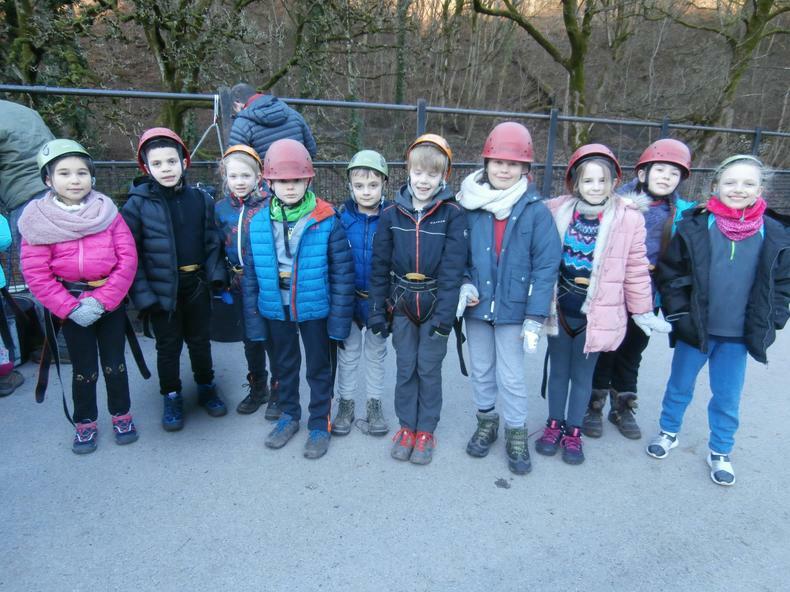 Everyone was really brave climbing down the ladder into the cave and they learnt so much about lead mining, volcanic clay, the industrial revolution and gems - a super underground lesson! 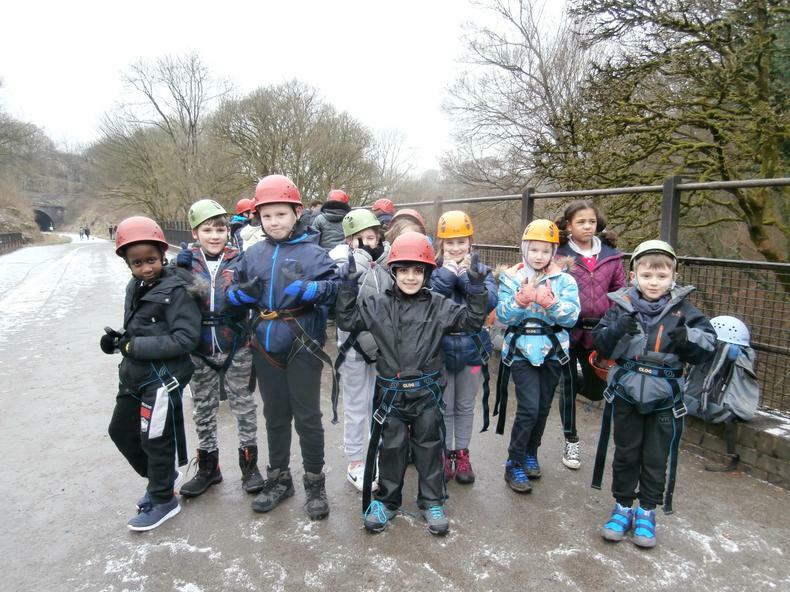 The Badgers (and Mrs Morley and Mrs Hussain) were incredibly brave and squeezed through holes, crawled under rocks, clambered through crevices and slid on their bottoms down through very tiny gaps! Everybody enjoyed their underground investigation and it made them think about what's under their feet! After lunch the Badgers went on their adventure walk to Robin Hood's stride and the snow came in thick and fast! There was even enough to make snowballs! Our fearless adventurers clambered up massive rock formations and did some 'weaseling' through little gaps. They learnt about hermits, cavemen, fairies and stone circles! Everyone enjoyed getting muddy and covered in snowflakes. 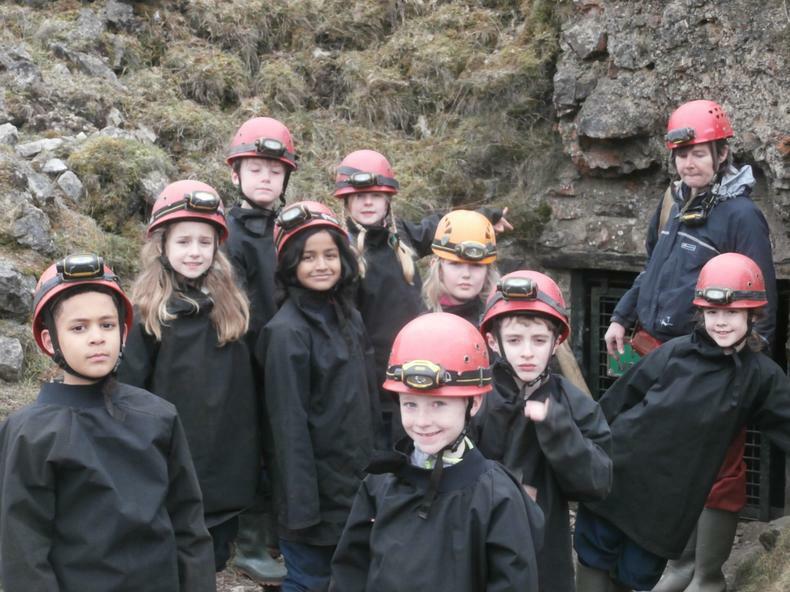 The Owls also went caving this morning, following in the intrepid footsteps of the Foxes and also explored Mouldridge Mine. Everyone was really brave entering the cave and soon discovered how exciting it is being underground! Discovering total darkness was great fun - not even being able to see your hand in front of your face. There was plenty of crawling and squeezing, and most of the Owls experienced sliding down a long drop! After lunch the Owls set off from Dukes Barn on their adventure walk and walked through the Chatsworth estate to pick up the Foxes minibus in Chatsworth House car park! The higher the Owls went, the colder it got and the snow started to fall! Just like the Foxes, the Owls stumbled upon a 'pop-up' café and paused for a welcome hot chocolate and a biscuit - thanks to those who carried them on their backs up from Dukes Barn! Fortunately we had a lucky escape when an Owl got their boots stuck in the mud! The rest of the team rallied round to rescue them - great team work Owls! It was a quick turn around when we all got back to Dukes Barn for showers and getting ready for tea. We all enjoyed a lovely plateful of sausages, mashed potato, Yorkshire Pudding and peas, followed by profiteroles and chocolate sauce! After ordering our breakfast and doing a bit of packing, everyone spent their money at the gift shop and are now settling down to watch a film. 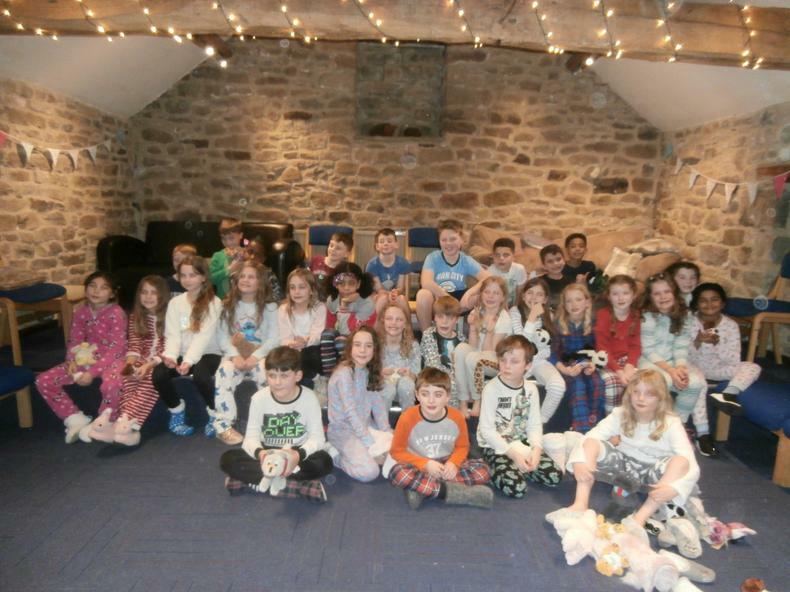 Up bright and early to clear out our dorms ready for 4B - and our last morning of fun at Dukes Barn! Good Morning from Dukes Barn! We had a lovely torchlight walk last night, followed by hot chocolate and a biscuit! All asleep by half past ten...but we've had some early (VERY EARLY) risers! Think we'll have some sleepy children later today...! Just about to start breakfast; toast, cereal and lots of croissants! Foxes, Badgers and Owls yesterday! The Foxes set off with their hats and caving waterproofs with Andy in the green minibus. A 20 minute journey led us to Mouldridge Mine, just a short walk from the minibus past lots of sheep, inhaling the 'rural' smells! Mouldridge Mine was fascinating, after a just a short stooped walk, it opened out into a large cave where we learnt all about lead mining and the minerals around us. There was lots of ducking down, some crawling and a little bit of bottom sliding! Some brave Foxes went down a little hole to challenge themselves whilst some stayed with Mrs Fearn to retrace our steps. We all met up, and then some Foxes led the way back up! Andy, our instructor then led us round to a squeeze and a crawl - all very brave Foxes! Then we were out in the glorious evening sunshine, and were first back to Dukes Barn! The Owls and the Badgers have all been abseiling this afternoon. The Badgers were all so brave and determined, everybody put on their harnesses and did the hard bit of stepping over the fence and almost everyone abseiled down! Even Mrs Morley had a go! The Owls were also brilliant and everyone abseiled off the bridge. There was enough time for more than one go, some even went down in tandem. Brilliant teamwork, and the children were really supportive of each other - and helped carry all the equipment to and from the minibus. After a tea of pizza and chips, followed by chocolate sponge and chocolate custard, everyone is in their dorms to do a little bit more unpacking and chatting. We will then get ready for our torchlit walk, and once we're back at Dukes Barn it will be hot chocolate and bed! Well here we are at Dukes Barn! A lovely sunny journey, and it was a good half hour before we got our first "are we nearly there yet?!". The children have had a tour of Dukes Barn and have met their instructors. We had an interesting half hour making beds - in most dorms we found piles of duvets with children underneath! But with a bit of help all of them now have their bed made. We have just finished our lovely packed lunches and the children now have a little time in their dorms having a chat before we set out for our first activities. The Foxes are caving and both the Owls and Badgers are abseiling. Bright and sunny, but VERY cold! !